(Phys.org)—A team of researchers with members from several institutions in South Korea has developed a new polymer that is able to improve the power output of triboelectric nanogenerators. In their paper published on the open access site Science Advances, the researchers describe the new polymer and how well it works when used in triboelectric nanogenerators. As computerized devices have grown smaller, it has become apparent that the natural progression is for some of them to evolve to an embedded form. Toting a phone around is useful, but a better approach might be one that doesn't require holding or otherwise keeping track of it. That leads to the problem of how to attach and power such devices. While work continues toward bendable devices that can be attached to skin or clothes, other research involves charging such devices using various kinds of generators—some might capture the energy expended in body movement, for example. Others might capture electricity that is generated by movement between objects or material, i.e., static electricity. Such devices are called triboelectric nanogenerators. Unfortunately, such work to date has led to products that are not capable of generating enough charge to power the devices that would rely on them. 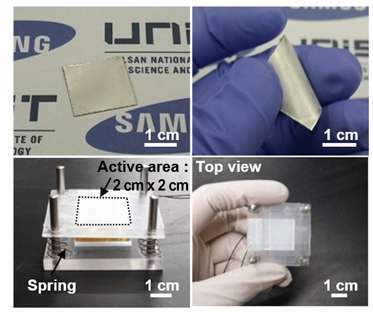 In this new effort, the researchers in Korea have found a way to improve power output by replacing one of its basic materials with a new polymer. To create and capture the power in static electricity, friction is generated between two materials, which results in the release of electrons that are absorbed by another material. Research into using such devices centers on the materials that are used, but thus far, it has been difficult to find materials that create a lot of charge but do not wear out quickly, and have uniformity of contact humidity resistance. The new polymer, the researchers report, is able to accept more charges from an electrode, which increases power output. The new polymer reportedly doubled the dielectric constant and also doubled the density of the charge—the researchers found power output to be 20 times higher than other devices currently being developed. The group acknowledges that more work needs to be done to address other issues with triboelectric nanogenerators, but believe their work will lead to a useable product someday soon. A robust nanogenerator based on poly(tert-butyl acrylate) (PtBA)–grafted polyvinylidene difluoride (PVDF) copolymers via dielectric constant control through an atom-transfer radical polymerization technique, which can markedly increase the output power, is demonstrated. The copolymer is mainly composed of α phases with enhanced dipole moments due to the π-bonding and polar characteristics of the ester functional groups in the PtBA, resulting in the increase of dielectric constant values by approximately twice, supported by Kelvin probe force microscopy measurements. This increase in the dielectric constant significantly increased the density of the charges that can be accumulated on the copolymer during physical contact. The nanogenerator generates output signals of 105 V and 25 μA/cm2, a 20-fold enhancement in output power, compared to pristine PVDF–based nanogenerator after tuning the surface potential using a poling method. The markedly enhanced output performance is quite stable and reliable in harsh mechanical environments due to the high flexibility of the films. On the basis of these results, a much faster charging characteristic is demonstrated in this study.